Hi Susan .. I have (now) to get on social media .. learn those skills - something I've been avoiding ... it'll be interesting to see how it goes - having some idea I guess helps ... which means my hanging around in the background has had its advantages ..
Oh Susan, I'll hop over to Diana's in a moment, she is doing an excellent job with her meet-n-greet! Social media, you gotta control it, because it can be so overwhelming. I use Blogger, FB and Twitter most, also LinkedIn. Sometimes I can lose myself on social media sites. It can be too time consuming. But those chocolate chip cookies, yum. I'm with you! I'm like you! Blogging was fun and easy for me to understand. I still do it. Facebook eventually grew on me but I still don't use it much. Twitter scares me. I look at Pinterest but I'm not a member or whatever you call it. GoodReads kind of scares me too. Some of it's because of the time issue on these and others because I just don't know how well I'll be able to navigate them. I've got my plate full enough anyway! Hi, Susan. You know me and social media, not much about it scares me. I've made more friends on Facebook than I have blogging. I hopped on the Twitter bandwagon years ago, but haven't been active there lately. I'm on LinkedIn, which is a great way to connect with others in the publishing industry, and I've just recently joined Pinterest, which I love for gathering ideas and as another venue for my blog posts. Heading over to Diana' now. All of the social media frighten me to some degree. I use Facebook and there are two or three of my readers with whom I like to interact when I can. This lets me learn more about them personally, if I desire that. I love blogging, fb, and twitter. I just don't have time for much more. Hi Marja - I get the Costco gourmet chocolate chip cookies. They're big enough that one satisfies me. Hi Linda - Time is always an issue for me. Most of my social media centers around blogging. Hi Karen - See you there! Hi Jess - LOL! My friend, who dragged me onto Facebook, showed me Pinterest. I get the distinct feeling she wants company over there. Hi Diane - Thanks so much for having me at your blog. Yes, I like Facebook much better than Twitter. Hi Cindy - I'm with you on the Twitter thing. All those hashtag things are confusing. Hi Nancy - Facebook has driven a lot of traffic to my blog. It's also been valuable connecting with my family. Hi Loree - Yes, I could stay on here for hours and sometimes do! Hi Susan, I like to use Facebook and Twitter. I find out about writers and readers from their posts.And of course, linking my blog to FB brings me new readers. Facebook brought quite a few people to my blog as well. I can't seem to get with Twitter. You're too funny Susan! There ARE some things we just have to draw the line on right?! And chocolate is a good place to begin. LOL, Fun post, Susan. I've left Twitter to chirp by itself too. :) And I agree...Under no circumstances should chocolate chip cookies get the boot. I've cut way back on chocolate, but I figure a few chips keep me happy. Hi Sarah - Twitter keeps sending me, "We Miss You Notices." LOL. They'll just have to do without me. I love love Facebook and spend most my time there but don't like Twitter much or any of the others. As to blogging, it has gone way down for me. I prefer Facebook to Twitter. Cutting back to two posts per week lessened the pressure with blogging. I both love & hate social media. I'm a Facebook visitor, mostly because it's such a good vehicle to staying connected to our grands, as well as our friends in Arizona. I'm not much for Twitter and all that other stuff. And now & then I actually send a text (so my grandkids think I'm smart). LOL! 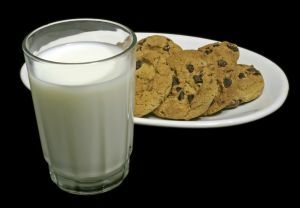 One of these days I'm going to give a character a serious love for milk and cookies. I guess it's no secret that blogging is my favorite form of social media with Facebook coming in second. I left a comment on your Meet & Greet over at Diane's. Great to get to know you better! Thanks for stopping by. Yes, I can get lost for hours on blogs and Facebook. It takes a lot of self-discipline to limit my time on social media.